FIRST WRITTEN REFERENCE: in the year of 1261. The municipality of Raslavice is situated at the Cergov Range, in the heart of Saris Region, and on the midway of the towns of Presov and Bardejov. It is well know for it´s maintaining and expansion of their national folklore tradition. 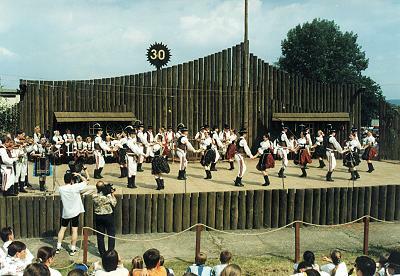 Every year on the third weekend of June, the Saris Festival of Songs and Dances takes place in Raslavice. The visitors are invited to spend a pleasant evening of authenticated folklore music and dancing with the folklore group "Raslavican". Except for the Saris Festival of Songs and Dances, there is also annually in the month of May the equestrian competition with horse racing and jumping in the local sporting area. In Raslavice, there is the seat of the Saris Region Art Gallery". One of the most spectacular parts of the gallery´s exhibitions are the great wooden statues. These statues are located in the gallery´s garden, where is also the possibility to have a pick-nick. Raslavice is also a good starting point for easy leisurely hikes. After seeing the newly reconstructed Monastery of St. Joseph with it´s large park, or the Jewish Synagogue, the visitors can continue with the site seeing of the unique wooden temples of the eastern castle that were built in the 18th century. Dominating in Raslavice is the newly built Roman Catholic church of the Virgin Mary´s birth. Other than hiking there also other sporting activities such as playing tennis or horseback riding. The visitors can enjoy a more diversified holiday time by boating along the Sekcov stream. In the House of Culture, there is a sauna bar and day bar as well as water cure and massages available. During the winter seasons, there is the possibility of down hill skiing (ski lift length is 350 metres). The "Dukla motel", in the municipality of Demjata (located 4 kilometres away from Raslavice) offers accommodation and catering facilities. Delicious meals can be enjoyed also at the restaurant in the centre of Raslavice. In the municipality of Raslavice, there is also the Health Center and service station. In the gallery there is a constant exposition works of carvers from the Saris Region. The exposition changes annually at the occasion of the Saris Festival of Songs and Dances and woodcarving plenary sessions in the village. 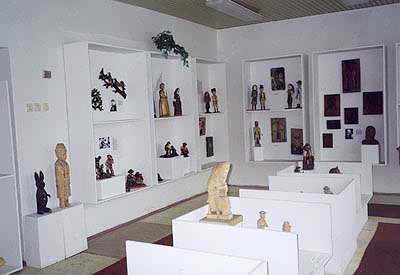 From all the fine arts, the carvings, paintings, sculptures out of clay and horn can be found here.